Decorative motifs over the entrance to the catacomb at Hal Resqun. A Roman catacomb, described as one of Malta's most intriguing, has been rediscovered within a roundabout near the airport after having long been buried under debris and asphalt. Officers of the Superintendence of Cultural Heritage confirmed that this is the same catacomb that was first excavated and sketched by Temi Zammit in 1912. The catacomb is in a good state of conservation considering its long abandonment, the superintendence said. 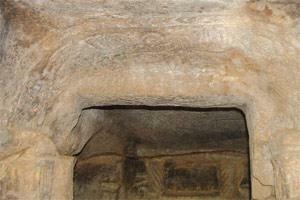 Its important decorations and figurative scenes are also well preserved and very legible. This important archaeological discovery was first made at Hal Resqun, a site on the outskirts of Gudja. It was excavated by Sir Temistocles Zammit but since then has been completely obliterated. The Superintendence said the tomb is of particular scientific interest for Malta's archaeology due in part to the refined use of decoration. The decorative scheme imitates Roman architectural motifs, such as a number of fluted columns etched into the rock face of the tomb. The site is unique in that it includes two scenes cut in low relief which include both human and animal figures and offer a very rare insight into what religious notions the Romans in Malta entertained with respect to death and the afterlife. Following Temi Zammit's discovery of the site, the catacomb was covered up by a road surface following the development of the Luqa airfield. The exact location of the Hal Resqun catacomb was then lost, although it was generally understood to lie within a roundabout close to the Bir Miftuh chapel at Gudja. Various attempts to relocate the site had failed in the past, resulting in an increasing fear that the catacomb may have actually been destroyed or lost forever. The Superintendence said that the rediscovery was made possible due to a number of precautionary measures put into place by the Public Transport Authority on the recommendation of the Superintendence. The road works at Gudja are part of a road-improvement project being undertaken by the ADT. The Superintendence said the tomb's re-discovery will hopefully lead to its permanent conservation for public benefit in terms of the Cultural Heritage Act.